Ruthin: Aberwheler (Bodfary Parish), Clocaenog Isa Ucha, Derwen, Efenechtyd, Gyffylliog, Llanarmon (2), Llanbedr Dyffryn Clwyd, Llandegla, Llandyrnog, Llanelidan, Llanfair dyffryn Clwyd, Llanferras, Llanfurog, Llangwyfan, Llangynhafal, Llanhaidar in Kinmereh (2), Llanrhydd, Llanychan, Llanynys, Nantglyn, Ruthin (2). The population falling within the Union at the 1831 census had been 16,019 with parishes ranging in size from Llanrhydd (population 97) to Llanhaidar in Kinmerch (2,066). The average annual poor-rate expenditure for the period 1834-36 had been £10,005 or 12s.6d. per head of the population. 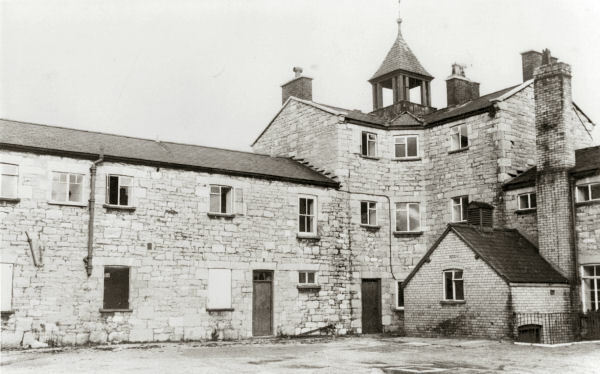 Ruthin Union workhouse was erected in 1838 at the north side of Llanrhydd Street to the east of Ruthin. The Poor Law Commissioners authorised an expenditure of £6,050 on construction of the building which was intended to accommodate 200 inmates. The site location and layout are shown on the 1910 OS map below. In 1930, the establishment was taken over by Denbighshire County Council and was redesignated as a Public Assistance Institution. The original workhouse buildings have been demolished. Some of the later buildings survive incorporated in the present hospital on the site. Ruthin entrance from the south, 2000. Denbighshire Record Office, Ruthin Gaol, 46 Clwyd Street, Ruthin, Denbighshire LL15 1HP. Virtually no records survive — it is said they were all destroyed in the 1960s by an overzealous Social Services before the Record Office was established. Only holdings are: Guardians' minute books (1837-44); Financial statements (1866-7); PLC order (1837).